Hi all....been a couple of weeks since I posted anything, sorry. I like to wait until I have a few things to show you. 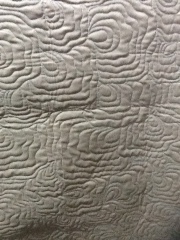 So...I can see the end of the Bargello quilt that I am hand quilting. I did finish a little project over Christmas...Chilly Willy. This pic is poor lighting, but here he is. Lily is a joy to quilt with...just totally different setup than the Tiara, and moving a very light weight machine instead of a heavy quilt takes adjusting to. We are getting there!!!! I'll bet it is a major learning factor, but I know you will master it in no time at all. Love the Bargello. 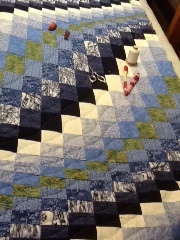 Lovely quilt and cute snowman . I am sure you will master your new machine quickly . Have fun . 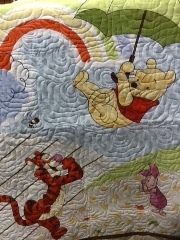 I love the Bargello and chilli and Winnie the Pooh are great fun.